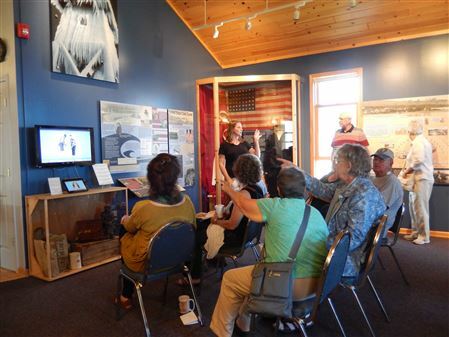 The exhibit encompasses the entire addition to the old lighthouse keepers quarters (the main museum) and was done very professionally. 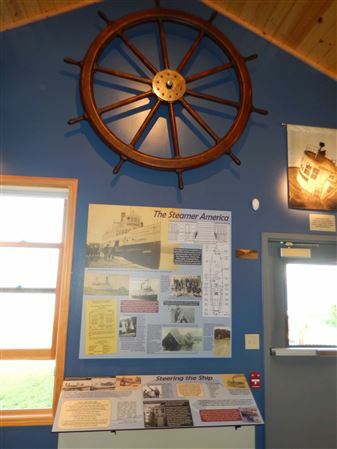 The SS America, which called at the remains of the old dock nearby, was featured prominently on the back way, with the ship's wheel displayed above. A local resident donated a weathered window from the pilot house, as the display was being built. Dory, a graphic artist, did a fantastic job creating an informative, easy to ready story of the ship and its relationship to Grand Marais. She incorporated two of my drawings from the America book, for which I gladly granted permission to use. 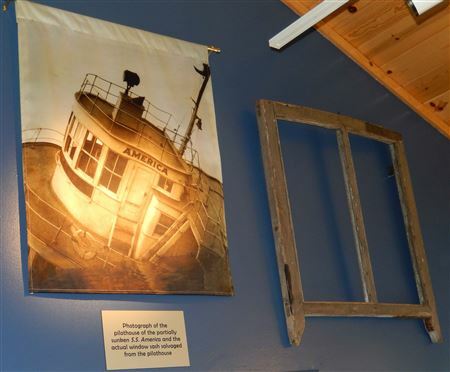 A piece of the Fresnel Lens from the old lighthouse is on display, along with some USCG uniforms and other items from a local resident who was in the service, are on display. Carrie and her husband received an invite from one of the fishing families who had a cabin on Isle Royale, to visit the site and remove many historic artifacts after their last relative who had rights to the island property passed away. Many of these were used to make up a large interesting display in the museum, with agreement to remove the artifacts granted by the NPS. Carrie benefitted from a Legacy Grant to help cover expenses of the room-sized exhibit. The turnout was excellent and filled the room. She provided herring, salmon and whitefish from a local fishery restaurant in town. The other food items and celebration cakes were delicious, too.Please stop by to see the Museum when you can get through the area. The Liberty anchor is sitting outside in front of the Museum.